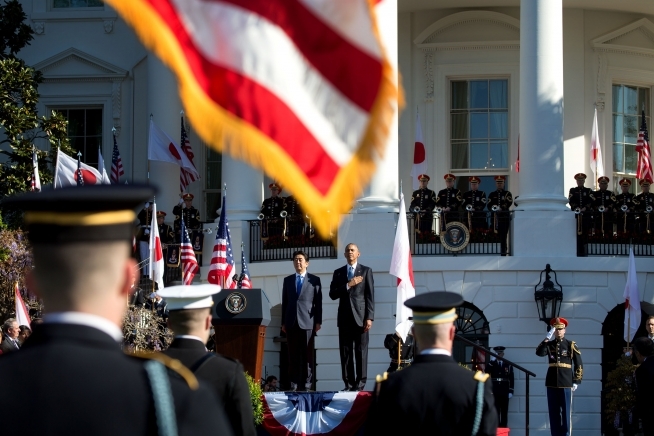 President Barack Obama and Prime Minister Shinzo Abe listen to the U.S. national anthem during Abe’s official state visit in April 2015. Public domain photo courtesy whitehouse.gov. Japanese Prime Minister Shinzo Abe’s historic visit to Pearl Harbor on December 27 symbolized not only the reconciliation of two countries who once were at war, but also what has become a close friendship and alliance that should be continued regardless of changes in administration, Sasakawa USA fellows said in media appearances in December. Tobias Harris, Fellow for Economy, Trade, and Business, and Tomohiko Taniguchi, distinguished non-resident fellow, also weighed in on the significance of the visit. In a Bloomberg News article, Harris said Japan is still seeking clarity on where the U.S.-Japan relationship will head under the incoming Donald Trump administration.